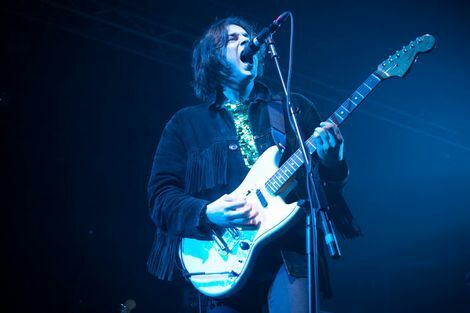 NME’s annual Award Tour arrives in Liverpool with mixed results from a wholly unmixed bag. Getintothis’ Andy Kelly sorts the no hopers from the next big things. It’s almost a cliché now that however early you turn up to the NME‘s annual touring bash that you’ll miss the start of the first band. Yes there’s four bands to get through but you can’t help thinking it’s all part of the ‘hype machine’ with often the most promising act thrown on at the bottom of the bill. Sure enough as Peace take to the stage we’re still queuing outside at 7.15pm and when we do get inside we find the Birmingham four-piece playing to a half empty O2 Academy. It certainly makes for a rather underwhelming start. The band’s floppy-fringed guitar rock takes Getintothis back to the early 90s when all those people who had fallen in love with MBV formed a band. Ride‘s Mark Gardener– coincidentally taking to the stage across town at Eric’s this very night – would have felt perfectly at home. It wasn’t bad, quite pleasant in fact with a little hint of Dinosaur Jnr in the background but it just didn’t inspire. Palma Violets have the NME to thank for being lumbered with the ‘Best New Band in Britain‘ tag which adorned their front page last autumn. That was after the band had made a big impression in these parts with their superb support slot to Savages at Leaf in what was one of our gigs of the year in 2012. 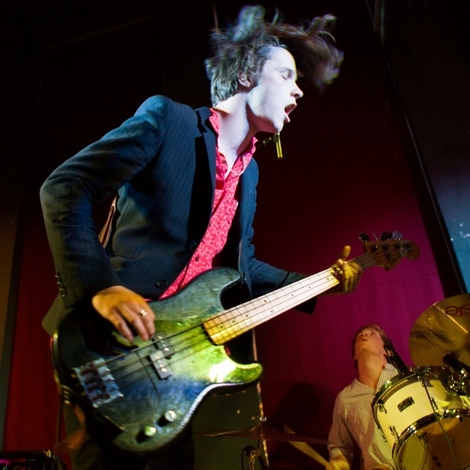 It was enough to send us over to Manchester’s Deaf Institute in the week of that NME cover, where again the band’s promise was there for all to see; a punkier post-Libertines sound with a couple of front men who could happily adorn many a teenage bedroom wall. Tonight they’re a rather different proposition and already they seem to have a lost a little of their edge. The sound seems to have been filled out a little with more keyboards and there’s a little less of that Buzzcocks-esque fun pop sound that they manage at their best, when they seem like the most enjoyable gang in town. They haven’t quite got enough good songs yet to fill out this slot but when they’re good they’re still very good. Best Of Friends was in everybody’s end of year favourite track lists in 2012 and gets another rousing run-out tonight, though the mosh pit still doesn’t quite get going, while the new single Step Up for the Cool Cats pinches a keyboard line from the Pale Saints‘ brilliant Sight of You to great effect. Overall it wasn’t quite their night but you suspect there will be others. Miles Kane was determined to make it his night and he did. With a home town crowd – by far the biggest of the evening – and with close pal Leighton Baines watching from the (rather rudimentary) VIP area on the balcony, the former Rascal and Last Shadow Puppet threw himself into his set with the confidence of a genuine showman. He’s got the look, he’s got the poses and we really wish he had the tunes because every time we’ve come across him he oozes star quality. Alas, we’re far from convinced about this ‘lad about town’ cross of Merseybeat and Weller-inspired mod. There are some high-points including some heavier sounding new tracks and in Don’t Forget Who You Are he’s got a tune which is likely to become a crowd singalong favourite for several years to come, full of lovely ‘la la las‘. When he gets it right – as in say Quicksand – you feel there’s a big hit just round the corner but at his worst he holds the attention like a Cast B-side. It just doesn’t touch your heart, your head or the soles of your feet. The crowd love him though, and we suspect Baines – who was a perfect gent upstairs posing for pictures with fans and signing autographs – would have been impressed by the footy-style chants of ‘Miles, Miles’ which erupted after Come Closer. Miles – having been around for a good few years now – was quite a surprising choice for this tour but he took his chance. 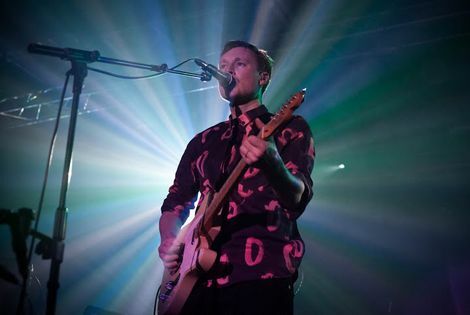 ‘Do you want to dance with us Liverpool?‘ shouts Django Django frontman Vincent Neff in his finest Derry brogue, and the answer would appear to be a definite ‘Yes‘. The crowd has thinned a good bit since Miles, but the Djangos aren’t going to let that put them off their bouncy stride. Buoyed by the success of last year’s impressive Mercury-nominated debut album, there’s a real confidence behind their arty electronica and you’d have to be confident to pull off those (apparently home-made) garish shirts. They look – and sound – like they have only recently been released from a locked bedroom, where they were allowed only to listen to Krautrock-lite and the Beach Boys. The Beta Band – much loved on Merseyside – are the obvious starting point via comparisons and indeed drummer David Maclean is the brother of the Beta’s John. I kept expecting those familiar Beta video backdrops, swooping at break-neck speed across sheep-clad mountains (or was I just pissed?) to reappear. Highlights include Skies of Cairo, as Kraftwerk‘s cousins take a stroll through a sun-kissed Egyptian bazaar sporting a jaunty Fez though closer WOR ran it close, the mosh-pit finally bursting into belated life. It’s not all good and at times you’d like them to release the brake and just unleash things a bit more but who couldn’t love a band who loop coconut shell intros and introduce giant tambourines to the stage. The undoubted highlight. One final point to make, is on the tour line-up as a whole: four acts, four members (five in Miles’), every one white, every one a bloke (men 17 girls 0), and all operating in the guitar-based terrain. Surely we can find a bit more diversity than this NME, can’t we? 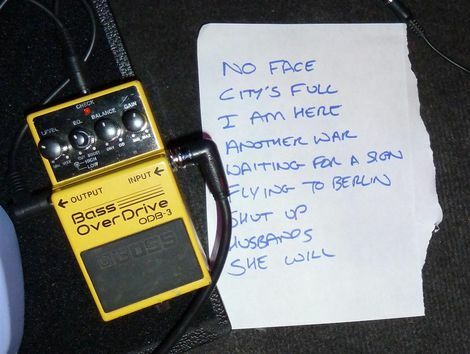 NME Tour returns to Liverpool – a reflection on previous NME Tours. 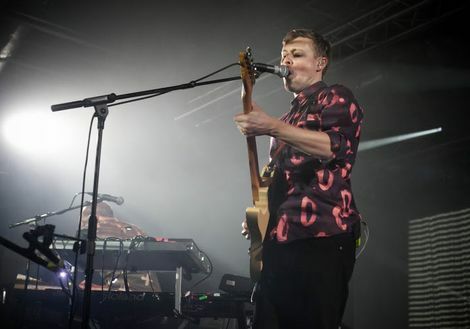 Getintothis reviews Django Django with Loved Ones in Liverpool. 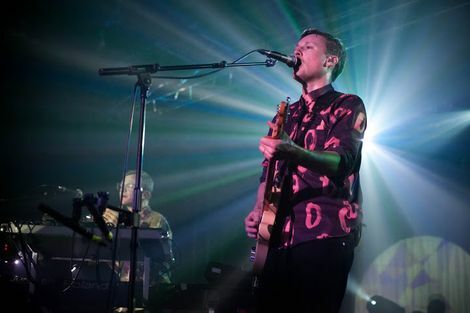 Getintothis reviews Django Django at Liverpool Sound City. Getintothis reviews Peace at the Kazimier. 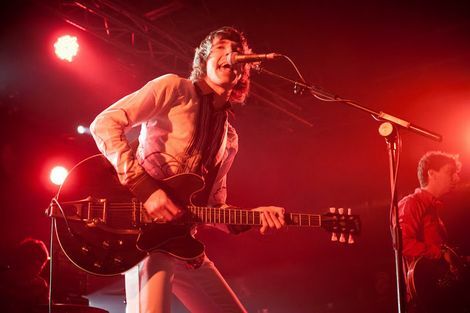 Getintothis reviews Miles Kane with Les Savy Fav at The Kazimier. 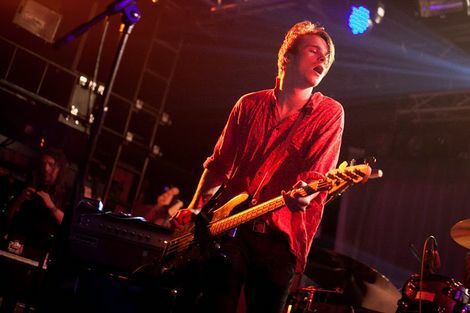 Getintothis reviews Palma Violets with Savages and Death At Sea at Leaf.